This article is about the New York City Subway station complex in Chinatown. For the station on the IND Eighth Avenue Line, see Canal Street (IND Eighth Avenue Line). For the station on the IRT Broadway–Seventh Avenue Line, see Canal Street (IRT Broadway–Seventh Avenue Line). For other uses, see Canal Street (disambiguation). Entrance to the station platforms before the rerouting of the M train. The complex consists of four originally separate stations joined by underground passageways. Three of the four are perpendicular to Canal Street, crossing at Broadway (Broadway Main Line), Lafayette Street (Lexington Avenue Line) and Centre Street (Nassau Street Line). The Broadway-Manhattan Bridge Line platforms are directly underneath Canal Street itself. The Bridge Line platforms serve as transfer passageways between all other lines. After leaving Canal Street, the Manhattan Bridge Line makes a hard right onto Broadway. The complex was fully renovated between 1999 and 2004. The Broadway Main Line station was restored to its original look with new mosaics featuring Chinese characters, reflecting the station's location in Chinatown. The symbols on the red wall plaques mean "money" and "luck" and the "Canal Street" name tablet has ideographs that read "China" and "Town." During the most recent renovation in the 1990s, the original mosaics were uncovered but then either removed or covered over again. One of the original tablets has been preserved at the New York Transit Museum. The complex has a total of 13 staircase entrances and 2 separate elevator entrances for the Lexington Avenue Line's platforms. The BMT Nassau Street Line platforms had two additional exits. One exit was accessible only from the now-abandoned eastern platform. The other exit, now converted to an emergency exit and crew rooms, is accessible from the passageway to the abandoned platform from the northbound BMT Broadway Line express platform. This exit leads to the northeastern corner of Canal Street and Centre Street, and features a provision for an escalator. Canal Street on the IRT Lexington Avenue Line is a local station that has four tracks and two side platforms. This station, opened on October 27, 1904, as part of the original subway. Due to platform lengthening in the 1940s and 1950s, there are two distinct sections of this station. The original portion has tile-covered I-beams with small and large mosaics and an ornamental ceiling. The newer portion has 1950s green tile at the end of the platforms. There are also IND-type "To Canal Street" signs. New lights were installed. Non-original name tables and small "C" mosaics exist. Each platform has its own ADA-accessible elevator (outside fare control) that leads to either northern corner of Canal and Lafayette Streets. These elevators were installed when the complex was renovated in the late 1990s and early 2000s. The northbound platform's elevator leads to the northeastern corner of that intersection, while the southbound platform's elevator leads to the northwestern corner. Because the elevators are outside fare control, there is no free ADA-accessible transfer between the northbound and the southbound platforms; however, both of the IRT platforms are connected to the BMT Bridge Line platforms, and thus to each other and to the rest of the complex, via stairways. Canal Street on the BMT Nassau Street Line has three tracks and two island platforms, but only the western island platform is accessible to passengers. Formerly, Canal Street resembled a typical express station except that the inner tracks dead-ended at bumper blocks at the south end with a platform-level connection joining the southern ends of the two platforms. These stub-end tracks were last used in the early-1990s, when the station served as the southern terminus for weekend J trains, and were rendered useless when weekend J service was extended to Chambers Street in January 1994. After a reconfiguration of the Nassau Street Line in 2004, the eastern (former "northbound") platform was abandoned and now used as a storage area and the platform-level connection was removed, allowing the former southbound express track to continue south. The westernmost (former "southbound") platform remains in operation and both tracks provide through service with southbound traffic using the former southbound "local" track and northbound traffic using the former southbound "express" track. The former northbound local track is now used only for non-revenue moves, train storage and emergencies while the northbound express stub track was removed. The former northbound "local" track merges with the former southbound "express" track (the latter of which is currently the northbound track) south of the station. This station was completed at the end of 1909 and included a bridge over the proposed Canal Street subway to cross underneath. Part of the Canal Street subway was built and is part of the Manhattan Bridge Line. Delayed by construction of the Chambers Street station, this part of the Nassau/Centre Street subway opened in August 1913. There was an opening in the center wall about fifty feet from the end of the station that had a narrow platform, which was used by train crews to cross between trains on the center tracks. In 2004, this opening was sealed with new tiling as the eastern platform was in the process of being closed. South of this station there are unused stub tracks that formerly extended onto the Manhattan Bridge. In the renovation, the original "Canal Street" mosaics were restored, and new wall and floor tiling were installed. The MTA defines this platform set as different stations in internal documents, but depicts the two levels of platform sets with one station symbol on maps. The four platforms of Canal Street, located on two separate levels, are considered the same station by the MTA on maps, but separate stations on other things, regardless are both a part of the BMT Broadway Line. One set of platforms is for trains traveling to Lower Manhattan and the Montague Street Tunnel; the other set is for trains coming from the Manhattan Bridge. Canal Street on the Main Line has four tracks and two side platforms. Only the outer local tracks, provide through service via the Montague Street Tunnel. The center tracks, which have never seen revenue service, begin at the unused lower level of City Hall and run north to here, dead-ending at bumper blocks about two-thirds of the way through. The center tracks can be used for layups, but this use has been completely made redundant with the nearby City Hall lower level being used as a layup yard instead. As part of the Dual Contracts, these center tracks were to have continued up Broadway, fed by traffic from Brooklyn and the Montague Street Tunnel; local service was to have terminated at the upper level of City Hall. That plan was dropped prior to the line's completion. A new plan favored local service via City Hall's upper level, reconstruction south of that station to join the local tracks with the rest of the line and express service via the Manhattan Bridge. Thus, City Hall's lower level was abandoned during construction and never placed in service. Today, just north of this station, the actual express tracks coming off the Manhattan Bridge curve north, rise up and replace the stub-end center tracks from City Hall's lower level. In the late 1960s, New York City Transit extended the platforms for 10 car trains. The Main Line station was overhauled in the late 1970s. The original trim lines were replaced with white cinderblock tiles, except for small recesses in the walls, which contained blue-painted cinderblock tiles. The staircases were repaired and new platform edges were installed. The blue cinderblock field contained the station-name signs and white text pointing to the exits. The renovation also replaced incandescent lighting with fluorescent lighting. In 2001, the upper level received a major overhaul before the Bridge level reopened. Among the repairs included the staircases, re-tiling for the walls, new tiling on the floors, upgrading the station's lights and the public address system, installing ADA yellow safety treads along the platform edges, new signs, and new track beds in both directions. Canal Street on the Manhattan Bridge route has two tracks and two side platforms. When it originally opened, this station was known as Broadway. 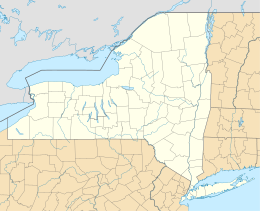 Although technically located on the BMT Broadway Line, it was originally a distinct station from the main line, as the two stations were not directly connected. It is located on the lower level and oriented perpendicular to the other portions of the complex. East of the station, the tracks cross the south side of the Manhattan Bridge to enter Brooklyn. West of the station, the bridge tracks curve to the north, and ramp up between the tracks from the local upper level platform to form the express tracks. Under the Dual Contracts, this station was meant to be part of a crosstown line under Canal Street, running from the Manhattan Bridge to the Hudson River, or towards West Street; however, prior to the opening of the Broadway Line, the BMT decided to route Manhattan Bridge traffic to the Broadway express tracks instead. After the lower level tracks curve north from the Bridge Line platforms, the tunnel continues straight ahead, past the diverge to the main line. The bellmouths going westward from the west end of the station are a provision from the original plans and run for about 100 feet. Also, sitting on one of the trackways is a storage building. 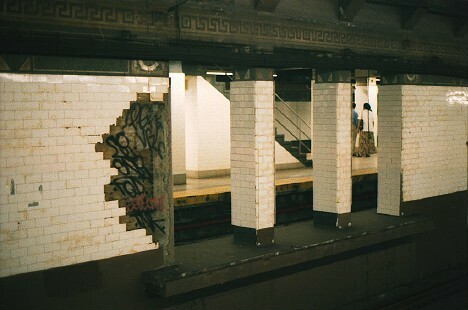 The original tile on this station read simply "Broadway" and there was a small either wood or metal sign attached to the wall beneath the tile name that read "Canal Street." Like the Main Line station, the Manhattan Bridge platforms were overhauled in the late 1970s. It received similar improvements, including blue-painted cinderblock tiles, new staircases and platform edges, and new lighting. With the exception of three months in 1990, train service to these platforms was suspended from 1988 to 2001 during the Manhattan Bridge reconstruction project. The platforms remained open for passengers transferring between the other routes, since they were the only connections between the other platforms in the complex. Service between Manhattan and Brooklyn was redirected to the Main Line platforms and used the Montague Street Tunnel. The three-month period was supposed to have allowed train service while work on the bridge was not being done, but on December 27, 1990, the discovery of missing steel plates and corrosion that threatened the bridge's integrity halted this service. In 1997, a temporary art exhibit known as the Canal Street Canal by Alexander Brodsky, was installed on the northbound trackway. It consisted of a large waterproof tub filled with water, with Venetian canal boats floating inside. The platforms reopened on July 22, 2001 with new tiling on the floors, upgraded lights and public address system, ADA yellow safety treads along the platform edge, new signs, and new trackbeds in both directions. East of this station are the trackways leading from Chambers Street on the BMT Nassau Street Line. These trackways led onto the Manhattan Bridge south side tracks, while Broadway trains ran on the north side tracks of the bridge. These tracks were disconnected with the opening of the Chrystie Street Connection in 1967 and no longer have rails or any other infrastructure. A permanent art installation titled Empress Voyage February 22, 1794 (1998) by Bing Lee. This is in a passage leading to the Bridge Line platform. ^ "City Subways Add 3 Transfer Points". The New York Times. January 16, 1978. p. B2. ^ The first five trains each weekday, between 6 a.m. and 7 a.m. travel via the bridge and stop at DeKalb Avenue. ^ "MTA Neighborhood Maps: SoHo / TriBeCa" (PDF). mta.info. Metropolitan Transportation Authority. 2015. Retrieved August 21, 2015. ^ "Our Subway Open: 150,000 Try It". The New York Times. October 28, 1904 – via nycsubway.org. ^ "Passenger Killed on Loop's First Day". The New York Times. August 5, 1913. p. 2. ^ a b Marrero, Robert (January 1, 2017). "472 Stations, 850 Miles" (PDF). B24 Blog, via Dropbox. Retrieved April 27, 2018. 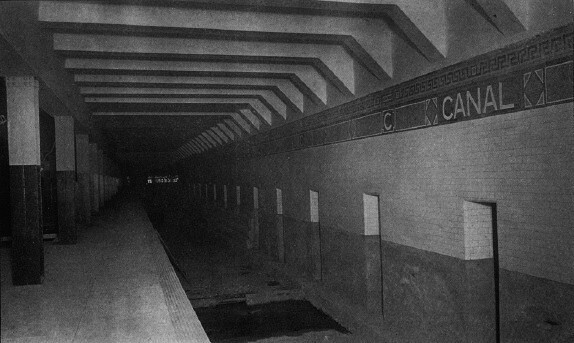 ^ http://www.columbia.edu/~brennan/abandoned/Canal.platf.jpg From the Abandoned Stations website: A Public Service Commission photo from 1909 shows the east platform with non-tiled steel columns. The view is looking south, showing the wall between the center tracks. The stepped structure at the base of wall near the image center is part of the bridge over the projected Canal St subway, not even begun at the time. The station looks completed, about four years before it opened. There is a rough strip near the platform edge. Track was to be installed by the operating company. 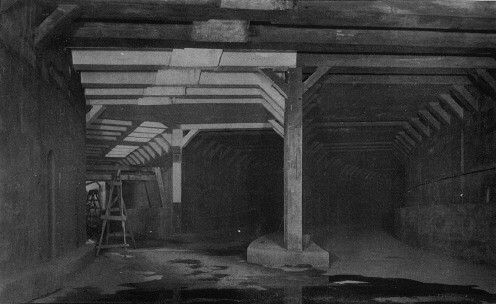 ^ http://www.columbia.edu/~brennan/abandoned/Canal.junction.jpg From the Abandoned Stations website: "Another Public Service Commission image shows the tunnel just south of the station as it was in 1909. Here, as in the plan, the trackways curving in from the Manhattan Bridge line, right, just run into the main line on the level. At left is the track opening into the east track of Canal St station. This arrangement was rebuilt in 1913-1914, shifting the track to Canal St station a little farther back, so that when the Manhattan Bridge trains began running in 1915, they reached the east side of Chambers St without crossing the tracks of the Williamsburg Bridge trains". ^ "Open First Section of Broadway Line". The New York Times. September 5, 1917. ^ "Open New Subway to Times Square". The New York Times. January 6, 1918 – via nycsubway.org. ^ Hevesi, Dennis (December 28, 1990). "Hazards Halt Manhattan Bridge Subway Line". The New York Times. Retrieved March 18, 2010. ^ Sims, Calvin (January 8, 1991). "New York Reopened Bridge Subway Line In Spite of Warnings". The New York Times. Retrieved March 18, 2010. ^ "Canal Street Canal, Alexander Brodsky (1997)". 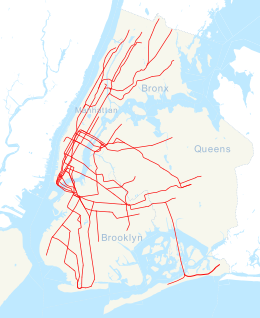 nycsubway.org. Retrieved May 18, 2010. 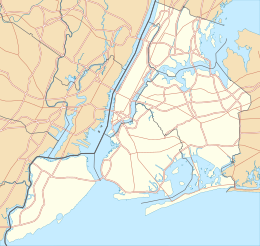 Wikimedia Commons has media related to Canal Street (New York City Subway). 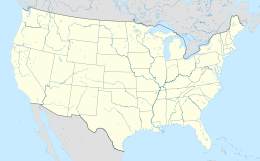 This page was last edited on 8 March 2019, at 07:51 (UTC).